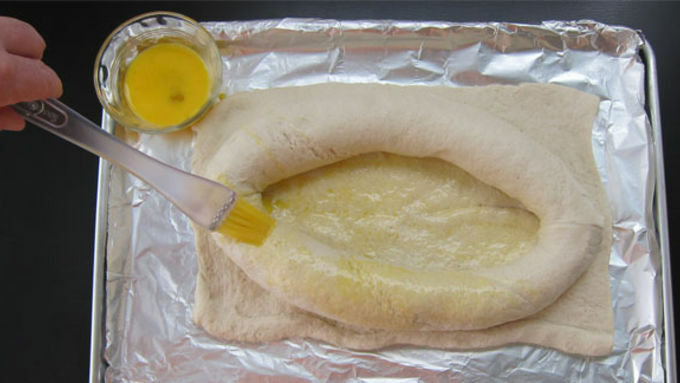 Unroll one tube of bread dough onto a non-stick tin foil lined or parchment paper-lined baking sheet. 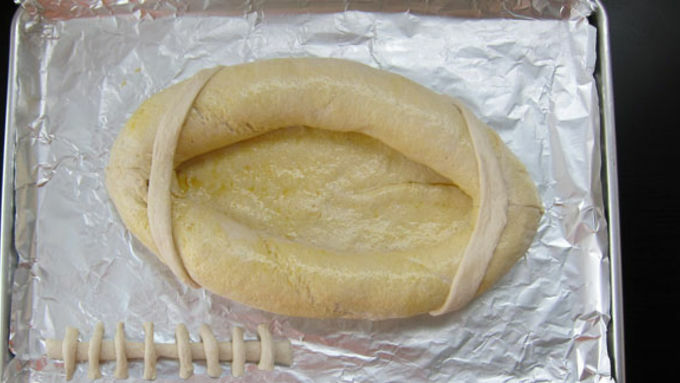 Set another roll of bread, on top of the unrolled dough, forming one side of a football. 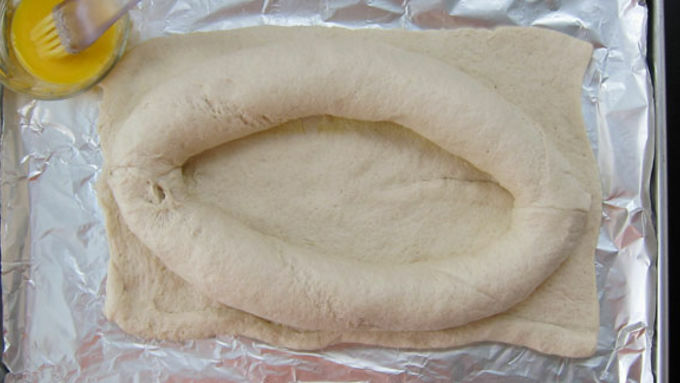 Set the other roll of dough opposite the first. Press the seems together. Brush egg wash over the football shaped bread bowl. Trim around the edge of the football removing the extra dough. Use that extra dough to make the stripes and the laces for the football. Bake for 28-30 minutes until the crust is golden brown. 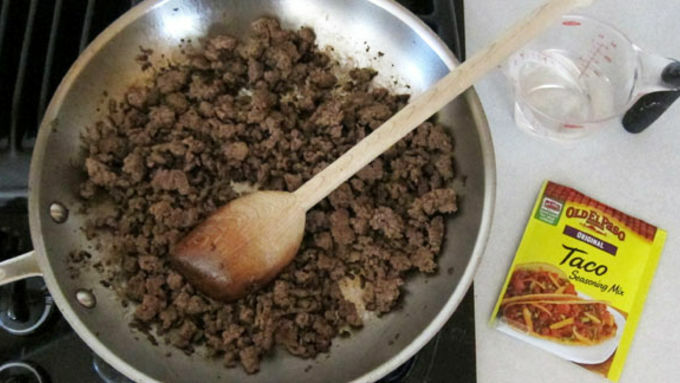 While the bread is baking, make your taco meat according to the Old El Paso™ Seasoning package instructions. 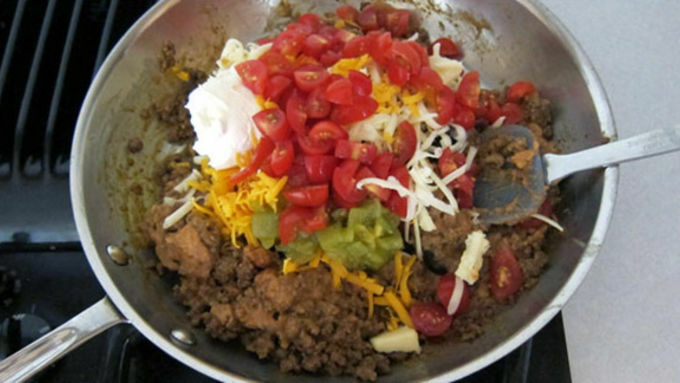 Once your taco meat has simmered and most of the liquid has evaporated, add the refried beans, chiles, tomatoes, olives, cheese, and sour cream. Stir to combine. Heat over low heat, stirring occasionally, until your bread bowl is ready. Remove bread bowl from oven. Carefully, cut out the center, making the opening in the bowl larger, leaving about a 2 inch border all the way around the football. Remove the excess bread. Be careful, the bread will be quite hot. Immediately fill the bread bowl with the taco dip. Heat in oven for 10-15 minutes, just until the dip is heated through. Serve hot, reheating in oven if needed. If you have a big crowd coming over to watch the big game, you'll need some hearty snacks for them to enjoy. It's a long game and I'm sure everyone will be hungry, so how about filling them with a meaty taco dip? 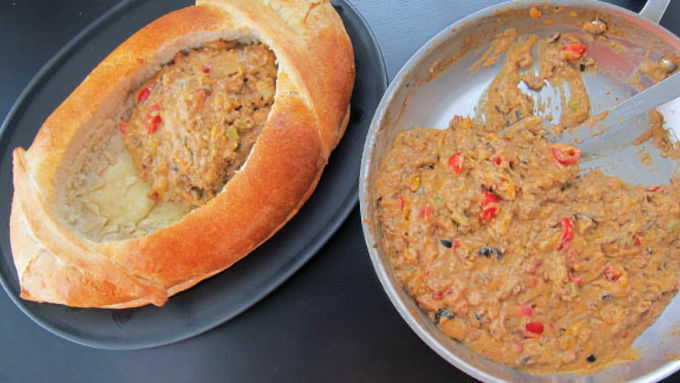 To make this Mexican appetizer really festive you can serve it in a bread bowl. 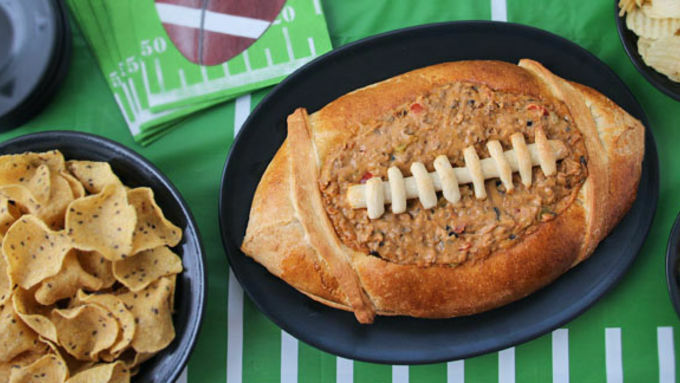 But not just an ordinary bread bowl... serve it in a football-shaped one! 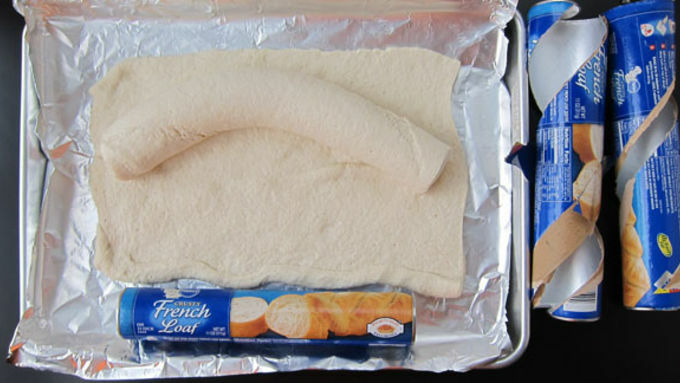 Making this edible serving dish is really easy when you use Pillsbury French Bread Dough. 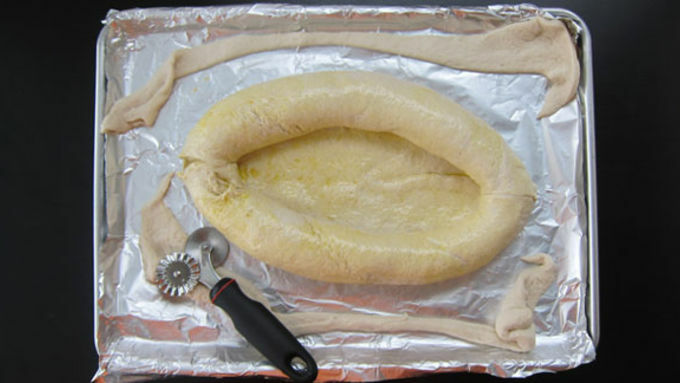 Three tubes of dough form this large, edible serving vessel. 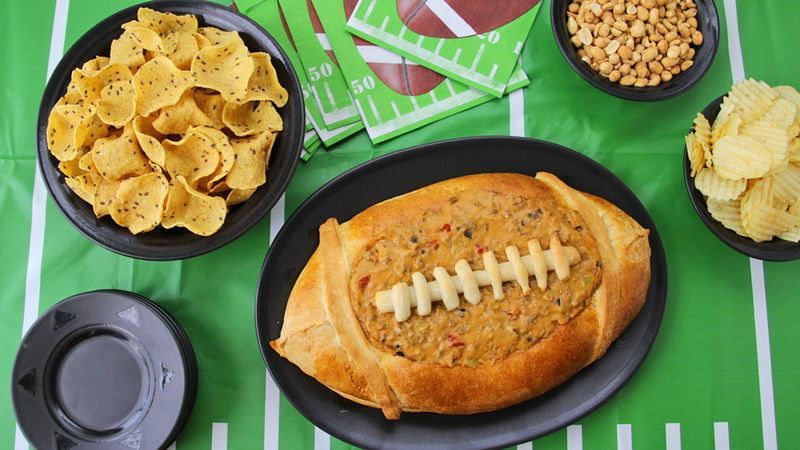 Once baked, fill it with the hot taco dip and your fans will cheer! You can reheat the dip as needed during your party. 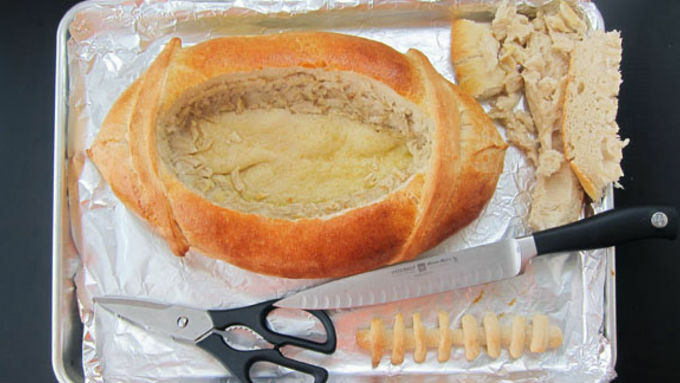 If you plan to make this ahead you can make the bread bowl and the dip the morning of your party and just reheat the dip, add it to the bread bowl and heat in the oven until hot. Serve with Food Should Taste Good Yellow Corn Dipping Chips. Enjoy!